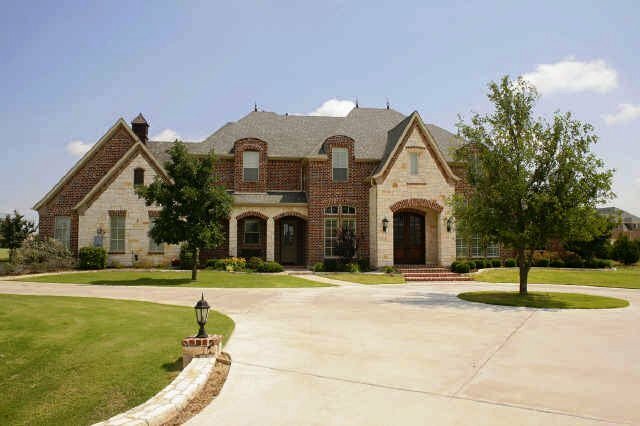 Luxury Estate - Lovejoy ISD - Estate Home In Fairview, Texas. ABR, Accredited Buyers Representative Broker, & Estate Realtor. elegant custom homes in Lovejoy ISD. SOLD by Jeanie Elliott REALTORS, Representing The Purchasers Only. 12 foot ceilings, heavy crown moldings, and extensive millwork. oversized full circle-around driveway with foliage and coach lights. 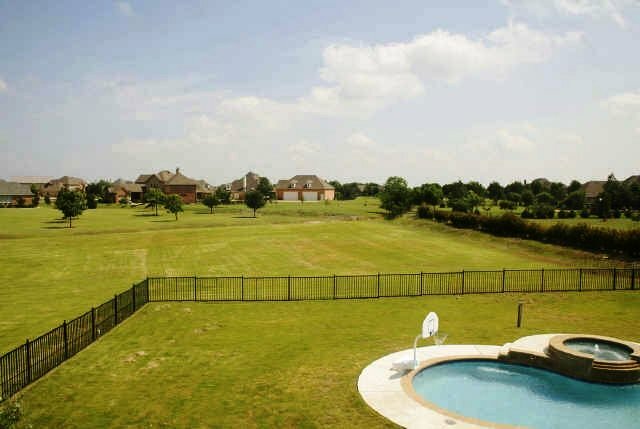 recreational facilities that require a true, Texas-size backyard. or build, and live in one of the fastest growing areas of the Metroplex. Community Lifestyle of still "Keeping It Country." Education Agency for the 2010 to 2011 school year. Interior Features: Kitchen-aid six burner gas cook top; stainless steel convection double ovens and microwave, granite counter tops, maple cabinets, vegetable sink with disposer in island; glass front maple breakfast room hutch with cabinets, granite counter tops, and crackled glass, large picture windows overlooking pool and spa; butlers pantry with wine refrigerator and glass fronted hutch, back access to garage and second stairs; separate front entrance to home from laundry and kitchen area; granite counters, art niche, rounded corners; bay window overlooks pool and yard from master suite with rounded full wall sitting area, plantation shutters, and private door to pool and patio; elegant master bath with separate sink and vanity areas, huge walk-in closet with built-in ironing board, 8 ft solid wood doors, jetted tub, walk-in fully tiled open shower with glass block, travertine floors and tub surround, granite counter tops and drop-in sink vanities, built-in coffee bar, linen closet and medicine cabinet; family room with extra large floor to ceiling stone wood burning fireplace with stone hearth and heavy custom wood carved mantle, hand scraped hardwood floors, floor plugs, open family room to kitchen and breakfast areas, full wall of windows to view outdoors and pool and spa; formal dining and foyer have 12 foot ceilings with unique crown moldings, extensive mill work, 9 inch three step baseboards, hand scraped hardwood floors, 8 foot solid core swing serving door, plantation shutters, and entry opens to formal staircase with wrought iron spindles and wood steps and hand rails; formal living room/piano room has glass-paneled french doors that open to the library/study area; the wood paneled library has hand scraped wood floors, plantation shutters, and a wall of custom, maple built-in book shelves, built-in desk and cabinets, and floor plug; there are 2 large bedrooms upstairs with window box seats, built-in book shelves, large walk-in closets, Jack and Jill bath with slate floors and soap stone counter tops; all bedrooms hold queen size beds; there is a large upstairs gameroom/den with built-in desk with granite counter tops and a full wall built-in TV unit and it is centrally located to the adjacent bedrooms and has a separate full bath; there is another small room upstairs that makes a great office, playroom or hobby room; there is a private guestroom downstairs that is next to the pool bath and on the opposite side of the home from the downstairs master suite; the downstairs laundry room has a second walk-in pantry, laundry chute, tiled floors, sink and freezer space, and convenient to the oversized, extra deep, three car garage with workshop and garage door openers; there are plantation shutters throughout the house; abundance of hand scraped wood floors downstairs, celing fans, two staircases; sound system wiring and speakers throughout house; wainscoting, decor lighting; energy star appliances; energy efficient HVAC; security system; fire sprinkler system; unfinished bonus room in attic space; cable TV & high speed internet wiring; raised ceilings with moldings and baseboards throughout; abundance of closets and storage space; large bright picture windows from virtually every room; sky windows above picture windows in some rooms; latest designer wall and decor finishing touches; price pfister upgraded faucets; arched openings and rounded corners; custom made wood front door with beveled glass; heavy crown moldings and fluted columns in foyer area and formals. Exterior features include: abundance of stone and brick; lightning rods, outdoor lightings, wired for outdoor kitchen, all brick fireplace, fully sprinklered 1.75 acre estate lot, fully landscaped with many trees and professional foliage, oversize full circle, drive around front driveway, end of cul-de-sac lot location, inground gunite diving pool with diving board and raised spa with waterfall and decking; wrought iron fencing; double pane low E windows, covered front and back porches with brick and stone columns; extra-long garage driveway; guttering; aerobic septic system; pool and spa equipment cleaning system; outdoor decor lighting and exterior lighting; custom designed and built with over 4,525 square feet of interior living space per appraisal; exquisite French Country Architectural Style with Traditional flair and finishes in a luxury estate lot setting on a cul-de-sac location with front of home facing south. If you are wanting to sell your luxury home, or in the market to buy a luxury home, call Jeanie Elliott of Jeanie Elliott REALTORS, an experienced luxury real estate specialist that has listed and sold millions of dollars worth of homes in the Fairview, Texas, Lucas, Texas, Allen, Texas, Parker, Texas, and Lovejoy ISD areas since 1980. The luxury property real estate market in those areas of Fairview that are also in the Lovejoy ISD area is one that is requested by many clients that are referred to Jeanie Elliott on a regular basis, contact us daily through the Jeanie Elliott REALTORS website, or have purchased other homes from our company in the past. In some cases, these clients are relocating here from all around the country or world, and they are used to the larger acreage estate lot properties in the areas they are moving from. Others are wanting to make a move up to a larger estate home to meet the increasing needs of their families or need more elegant homes and luxury floor plans that are suitable for entertaining business or social groups and want an estate home property with the latest special features, rooms and finishes for their changing lifestyle or specific interests. Still others, are moving from other parts of the Metroplex and seeking the best schools or wanting to make a purchase in the best real estate market areas for investment and business reasons. The number of properties for sale in the luxury home market in the Fairview/Lovejoy ISD area is currently below the demand in some price ranges, especially as we move into the Spring/Summer market of 2011, where a large number of sales occur prior to the start of the next 2011-2012 school year. If you are thinking of selling this year, call Jeanie Elliott, an ALHS, Accredited Luxury Homes Specialist at 972-612-2277 today to discuss our confidential and professional real estate services for our luxury listings that is designed to deliver the right home buyers for your property at the maximum, competitive price. Also, we will customize an individualized marketing plan to present your luxury estate home using the CHMS, Certified Home Marketing Specialist programs, featuring luxury home staging techniques and proven luxury home decorating ideas, virtual tours, multiple photographs and detailed property information. The CHMS, Certified Home Marketing Specialist program is the only program for home staging that is recognized by the Texas Association of REALTORS. Ms. Elliott has earned the professional CHMS designation, and will incorporate these skills in the luxury home marketing plan which results in higher selling prices and reduced market time for her luxury real estate property listings. To make an appointment, call 972-612-2277.